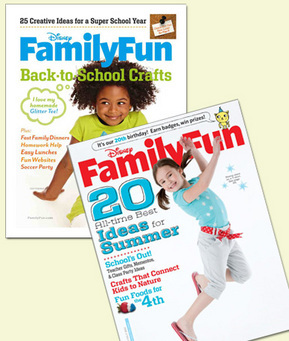 Disney’s Family Fun Magazine is one of our family’s favorite magazines. It is packed with family friendly ideas, crafts, recipes and more! My kids love receiving this in the mail. Today’s Mamsource deal is for new subscribers only. For $5 you get a One Year Subscription or $10 for a Two Year Subscription. Also, if you are new to Mamasource, Use new-buyer coupon code DISNEY20 to take an additional 20% off a 1 Yr or 2 Yr Subscription to Disney Family Fun Magazine! Valid for new subscriptions only. Limit (1) per household. May be used for gifts. Offer valid only July 7-11, 2011. Will automatically receive subscription in 8-10 weeks upon payment. U.S. only. No refunds.